Moonriver Model 404 is the outcome of a 3-year research, the aim being to achieve incredible performance regardless of price range. The 404 amplifier will extract hidden elements and render textures from within any audio format, with the source, speakers and room to set the limits. Its culture will suit all music, as the Model 404 is by design set to define the faintest nuances of which tone integrity is composed. A hefty supply section ensures that ample healthy power is available at all times at all stages through separate rails. A fully discrete preamp section serves for acute dynamic awareness, while a high output stage that is custom-optimized for bandwidth and distortion warrants for neutral predisposition and transient fidelity. A laborious selection of components armors the design against tonal alteration, pretentious or not, thus preserving naturalness throughout the shortest feasible path. 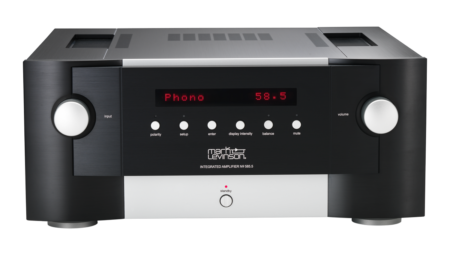 Furthermore, an integrated phono stage, a USB DAC, two preamp outputs and a tape monitor loop expand functionality to form an ideally flexible integrated amplifier. 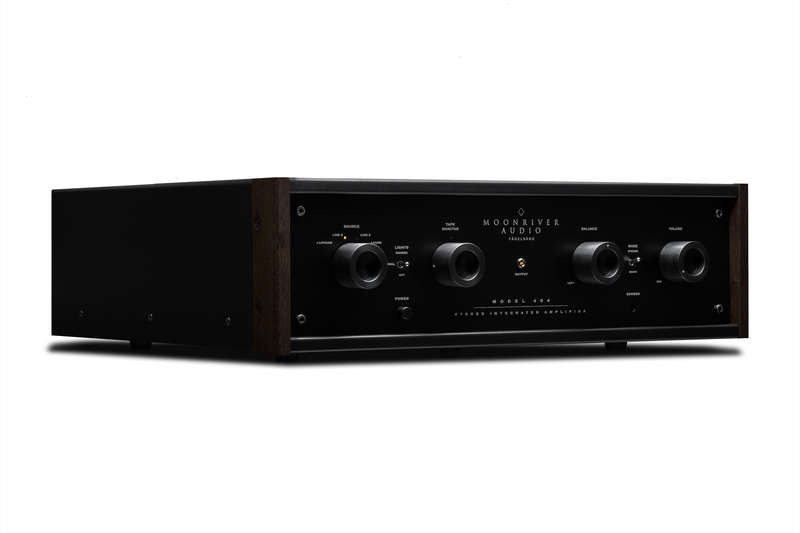 We had a very clear vision when we conceived the Moonriver 404 amplifier: Classic design with a modern touch; high quality materials such as massive aluminum knobs, solid walnut cheeks, sturdy enclosure; ergonomic user interface. There are no “shaved” aesthetics here, no display with complicated serial menus and hidden functions, nor a single multi-function knob for “minimalistic” purposes. The heart of Model 404 is pure and minimal but the interface is user oriented and easy to operate by anyone in seconds with no need to resort to the user manual. Four knobs and three switches give direct access to any function. 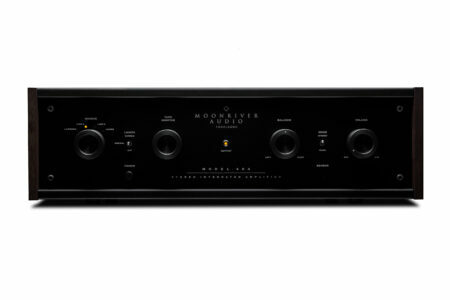 Moonriver 404 amplifier is modular by nature; it can accommodate an MM or MM/MC phono stage and a USB asynchronous DAC. Fitting these modules is simple and can take place at any time, on or after purchase. 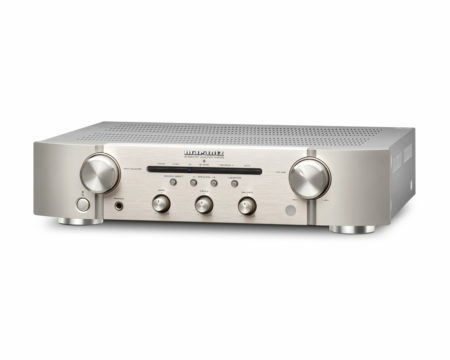 The USB DAC may also be upgraded with a newer version to meet future needs. You may find this feature to be vanishingly scarce in audiophile products as a result of today’s “minimalist” design mentality and the various myths accompanying it. However, balance control addresses a common problem; speakers that are positioned in asymmetry, in a non-balanced room environment. It thus provides the simplest tweak towards achieving a proper sound stage. Living rooms and house furniture are meant to serve everyday life and may not be provisioned with an ideal listening spot, evenly distanced from each speaker to form an equilateral triangle. It is also not uncommon for one speaker to have to be placed nearer room boundaries than the other, having various frequencies boosted in a more or less predictable pattern. More often than not, balance control would come in handy in that it drastically helps overcoming volume level unevenness and in some cases even reclaiming stereo effect and the resulting focused sound stage. 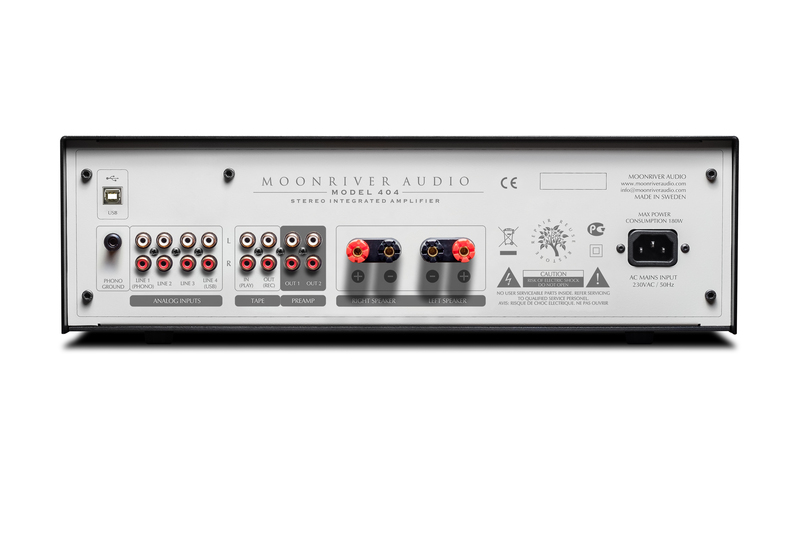 As expected, the way balance control is implemented on the Moonriver 404 amplifier, in parallel, will not degrade or affect the signal in any way determinable. Model 404 incorporates no less than 5 separate power supplies, each featuring overload protection. The power amplifier specifically runs on a dual mono configuration, beginning from separate windings on the toroidal transformer. Signal switches are implemented via relays, while volume attenuation is trusted on the legendary blue ALPS pot. A soft start circuit based on a 30A relay ensures that even the on/off switch is thought out to work with virtually no burden or wear for decades. Components are carefully selected for both suitability and reliability. We make no use of surface-mount in analog circuits, despite the fact that through-hole costs more and requires advanced space management & layout strategies. Each element utilized has to be of proven stability and sustained higher performance -proficient implementation provided- before making it into our analog paths. As for the sound, we are not to say whether Model 404 is virtually transparent or inherently forgiving. Voicing it to appreciate the playlist and respect the user at all times has been the sum of all our effort; a sincere effort to achieve effortlessness. Probably most of today’s manufacturers reject the idea of their product featuring a tape loop. At Moonriver Audio, we have concluded that the tape monitor loop is essential. Not only does it add the option of monitoring the difference between recorded and source material at a real time. It also, and most importantly, makes possible to insert to the chain -at will- a digital or analog room correction processor, a buffer, a noise reduction system or any other line device available to improve the sound of connected sources. As vinyl record revamping climaxes, whether a modern rage, a fashion thing or a real movement, countless monaural pressings emerge out there, often along with their digital… image. Too many of them, among others waiting to be rediscovered, have currently become collector’s items, 78 rpm direct-cut gems being no exception. This is not unreasonable, as what happened between say the 30s and the 80s in terms of both musical interpretation and recording technique is by many considered to be “most of the music” – this sentence doing perhaps no justice to stunning actual developments in creation and reproduction. Stereo/mono switch gives you the chance to enjoy recording art milestones with respect to how they were initially intended to please; in genuine mono, 2-channel, doing away with artificial phase discrepancies induced by mandatory stereo mode. So, “less” may well be “more”, but better is to have a choice. Model 404 comes with two options in the phono stage department; one is MM only and the other is MM/MC selectable. Both follow the exact quality principles that Model 404 is built on. Quality components and massive power supplies are also employed here, to efficiently accommodate very low noise, high performance op-amps. What was desired for our USB DAC module was not to make an addition rather than an omission; instead we had to be confident of substantially raising the true value and functionality of Model 404. 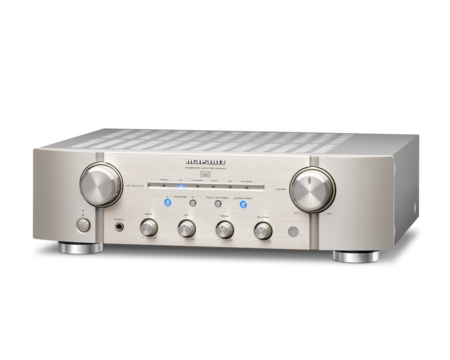 Some key features; state-of-the-art XMOS USB asynchronous interface; AKM 4490 DAC chip; separate high-precision clocks for the 44,1K and the 48K sample rate group respectively; supports PCM streams up to 384kHz. USB, D/A and analog out section each one fed by its own dedicated power supply. We work hard to get the best possible sound performance and we believe that this USB DAC is a enormous added value to the Model 404 amplifier. Inspired by the famous song, Moonriver Audio is a combination of the vintage and the contemporary in audio reproduction. Classic, timeless, user oriented design. Organic texture acquired within an open space, dynamic behavior unrestrained while preserving natural color, provisions made for modular upgrades and direct access to all functions. Moonriver loves vinyl records, analog tapes, compact discs and digital streams and features upgradable modules for all those formats. We employ every technology available today, without staying dogmatically exclusive to one design principle versus another, be it solid state, integrated circuit or vacuum tube. We are fond of hybrid designs that fuse well known and fresh tech elements, but, most of all, that fit the application. Our products are designed and made in Sweden. We hand-assemble each unit, a painstaking but precise procedure. 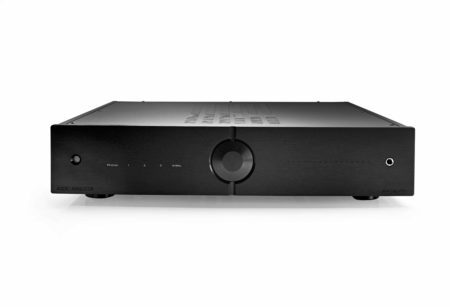 Through a global inventory that is constantly updated, it is our sophisticated research, efficient development and extensive listening tests -the fun part- that lead us to select the right component for a no-compromise audiophile sound. We also care for sustainability as well as for reliability. Moonriver products are covered by a 3-year warranty (6 months for vacuum tubes) and are designed to last for decades without any need of maintenance.